It is possible to exaggerate the substantive outcome of the summit meeting of the BRICS countries last week in Sanya, China, and, equally, it may seem expedient to underplay its meaning and consequence. But three things stand out. First, it is no more possible to ignore the BRICS; simply put, it has come to stay as an enduring feature of the global economic and political architecture. Second, BRICS is unique; nothing like this has ever been attempted before in the international system involving a dialectic of differences and diversities coalescing with convergences and commonalities and stimulating cooperation. Third, it is virtually impossible to duplicate BRICS; you can imitate it, maybe even parody it, but you can never quite replicate it as a geopolitical reality. A grouping of five countries, which as of today account for 43 percent of the world’s population, 18 percent of the world’s economic aggregate, 15 percent of international trade and which attract 53 percent of the foreign capital, cannot be ignored. The BRICS, unsurprisingly, hopes to work toward a new era in global finances and politics. The BRICS countries’ claim to have a greater say in the world order is compelling. Look at the forecasts. According to the International Monetary Fund, by the year 2015, BRIC countries (excluding South Africa) will account for 21.6 percent of the world GDP on par with that of the United States; 20.1 percent of world exports, which will be more than double the share of the US; and account for 18 percent of the world imports as compared to the US’ estimated share of 12 percent. The numbers and the trends heavily favour the BRICS. The significance of the Sanya summit lies in that the BRICS countries themselves are becoming aware that although their grouping is an ad-hoc one and had a patchy record so far, they have a strong potential to emerge as a new force in world politics. They didn’t have such a hang of the state of play, of their collective strength until now and, ironically, it was the global financial crisis of 2008 that went a long way in boosting their self-esteem. The speed with which they recovered showed not only that they were no longer vulnerable to an economic downturn in the US and Europe but also that even if demand slackened in the industrial world, they could still be in business by turning to each other (and other emerging economies). In fact, the BRICS economies’ need to effect huge imports of equipment and machinery, capital and technology in order to meet the requirements of their urbanization and industrialization demands have become a factor for driving global economic growth and for the recovery of the western economies. The BRICS countries have also become big investors abroad, including in the western world. In short, BRICS countries are well-justified in calling for far-reaching changes in the globalfinancial and political order so as to reflect the new realities. The BRICS countries share the dissatisfaction that the West has dominated the global debate and this is not in sync with the multipolar world that is taking shape. In sum, a more inclusive system need to replace the existing system built after World War II. The Sanya Declaration vowed to support the reform and improvement in the international monetary system. It underscored, “The international financial crisis exposed the inadequacies and deficiencies of the existing international monetary and financial system.” Accordingly, it called for reform of the management structure of the international financial institutions so as to reflect the changes in the world economy as well as to give greater representation for emerging economies. A salient of the Sanya summit was the support voiced by the BRICS countries for reworking the composition of the basket of currencies constituting special drawing rights [SDR] as well as the role of SDR itself. The BRICS’ support of a “broad-based international reserve currency system providing stability and certainty” cannot but be noted as a barely-disguised swipe at the worthiness of the dollar as the leading reserve currency. In essence, it meant a call to realign the post-World War II order that led to the ascendancy of the US. 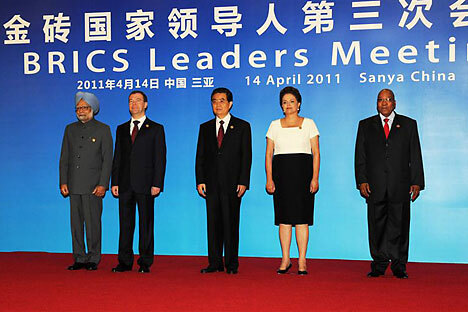 Two other specific actions and recommendations of the Sanya summit were an agreement for development banks of the BRICS countries to open mutual credit lines denominated in local currencies as well as warning over the potential for “massive” capital inflows from the developed nations that could destabilize the emerging economies. O’Neill is right. A host of trade disagreements bedevil the intra-BRICS ties. Brazil and India want China to buy more value-added goods and seek greater access to the Chinese market while South Africa wants China to buy more processed goods and less of raw materials. Both Brazil and India feel that China’s undervalued currency could be hurting their exports. And considering that China has emerged as the number one trading partner of each of its BRICS partners, Beijing is called upon to provide answers to trade disputes. Oleg Fomichev, Russia's deputy economic development minister, said China pledged at Sanya to set up high-technology projects with Russia, “not just importing our resoources and exporting industrial goods.” India’s trade minister Anand Sharma echoed this when he revealed that at the closed-door meeting Chinese Commerce Minister Chen Deming assured his BRICS counterparts that Beijing would make it a priority to import more value-added products from its partners. It is possible to exaggerate the BRICS stance as a “strategic defiance” of the US-led coalition which has militarily intervened in Libya. But then, there are caveats. The fact remains that when the chips were down and the voting took place on Resolution 1973 in the UN Security Council on Libya, BRICS countries not only didn’t oppose the western move but abstained and South Africa even voted for the resolution. Their ambivalence on this score has since seized by the US and its European allies to deploy the North Atlantic Treaty Organization to militarily intervene in Libya through aerial attacks so far that may even extend to deployment of ground troops at some future stage. Not only that, on the same day that the BRICS adopted at Sanya a critical stance on the western military intervention in Libya, the leaders of US, Britain and France made the unprecedented move of writing an open letter asserting that Resolution 1973 indeed empowered them to seek “regime change” in Libya and they shall not rest until the regime of Muammad Gaddafi is overthrown. In short, the West has put the BRICS on the mat within hours of forging its newfound identity. The nonchalance with which the US and its European partners have done this only goes to show that the BRICS’s rites of passage as a force to be reckoned with in global politics aren’t going to be easy. Meanwhile, the West will regard it expedient to deliberately cast aspersions on BRICS’ credentials and its cohesion and will expansively dwell on the differences that may be existingamong the member countries in the grouping. The heart of the matter is that South Africa’s membership of BRICS has no doubt rattled the West since it is happening at a time when as President Jacob Zuma put it, “Africa is moving away from the margins”, and the continent’s alignment with the grouping gives ballast to the latter’s positioning as a counterweight to the western economies. South African commentators have widely noted that the BRICS club will increasingly take on a political form as it gets institutionalized at some stage, it could become a counterweight to established western interests – “the B5 versus the G7”, as a prominent Johannesburg-based research firm that specialises in emerging markets, Frontier Advisory, put it. South Africa has eagerly embraced the BRICS’ emphasis on the need of a “multipolar” world, a euphemism for a world in which the US is no longer the sole superpower. The US and its western partners would have noted that it was ultimately China which invited South Africa to join the BRIC. China’s influence in Africa is growing rapidly and by recruiting the biggest African economy into the BRIC club, Beijing can be expected to significantly enhance its influence in Africa. South Africa can provide the gateway into the rest of Africa and foreign minister MaiteNkoana-Mashbane is on record that her country will “speak for Africa as a whole” from the BRICS podium. The BRICS’ Sanya summit may well come to be noted in the final reckoning as a landmark event where China stole a march over the West in the developing great game in Africa, whose vast resources have been, still are and will for the foreseeable future remain crucial for the sustenance of the prosperity of the European economies. BRIC’s evolution as BRICS compels the West to negotiate with the African countries rather than dictate.